Starting today, the five-day festival known as Diwali—literally, “a row of lights”—will be observed by millions of Hindus, Sikhs and Jains worldwide. 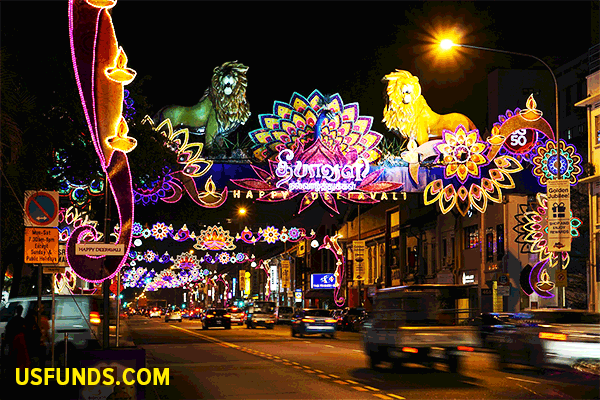 A celebration of good triumphing over evil, the festival typically coincides with the Hindu new year. Regular readers of Frank Talk should know that Diwali is also an auspicious time to buy gold coins and jewelry as gifts for loved ones, and in the past the increased demand has been enough to move gold prices to the upside. 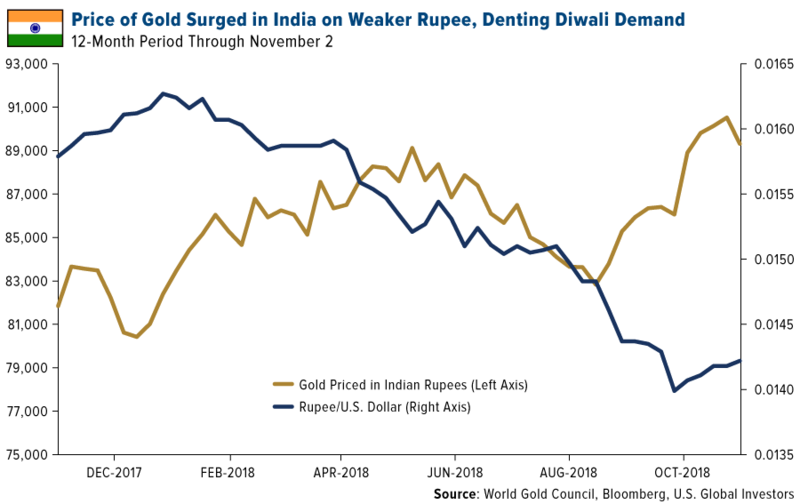 This year, however, demand for coins and jewelry was muted leading up to the fall festival on account of a weaker rupee relative to the U.S. dollar. This made the precious metal less affordable for some buyers. By the end of October, gold prices were at their highest level since September 2013, according to Reuters. Gold ordinarily goes for a premium in anticipation of Diwali, but this year many retailers reported trying to attract customers by offering discounts. And there could be more rupee pain ahead. In a recent note to investors, UBS forecast that the Indian currency will likely remain under pressure as global oil prices stay elevated. India is a net importer of crude oil, which has risen more than 20 percent in the 12-month period, thanks to supply disruptions in Venezuela, Libya and elsewhere. U.S. sanctions on major oil state Iran—India’s third largest supplier of crude following Iraq and Saudi Arabia—have also lifted prices. Those sanctions went into effect this week. Nevertheless, India’s economy is advancing at the world’s fastest pace right now. I believe this should have a positive effect on gold demand in the long term as the size of the country’s middle class expands. 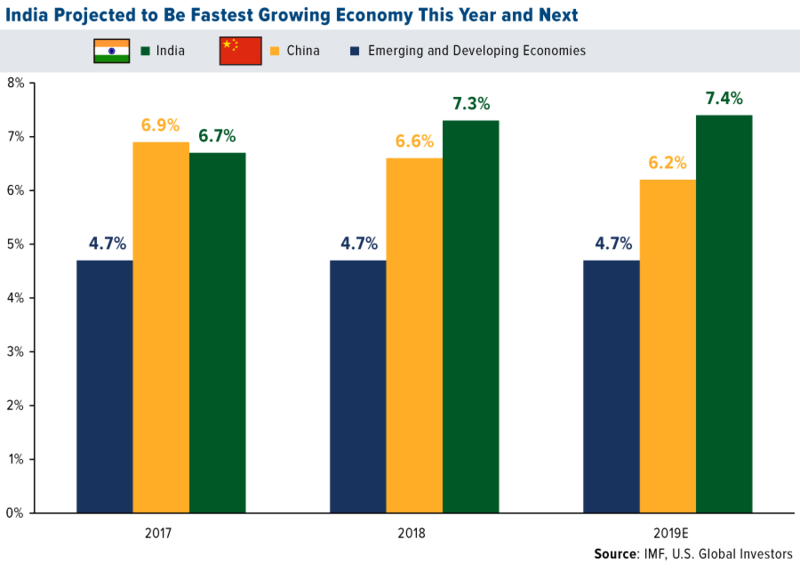 The International Monetary Fund (IMF) recently predicted the Indian economy this year to grow 7.3 percent, or 0.7 percentage points over China’s anticipated growth rate and an incredible 2.6 percentage points over emerging and developing economies on average. Next year India is expected to grow even faster, at 7.4 percent. What’s more, India’s billionaire wealth increased 36 percent in 2017, according to a recent report by UBS. The number of billionaires in India rose by 19 to 119 in total. Again, I expect this to have a noticeable impact on gold demand, the greater this wealth builds.